Chicken salad comes in so many different combinations. It’s one of those recipes where you can add a little of this, or a little of that and it turns out great each time. 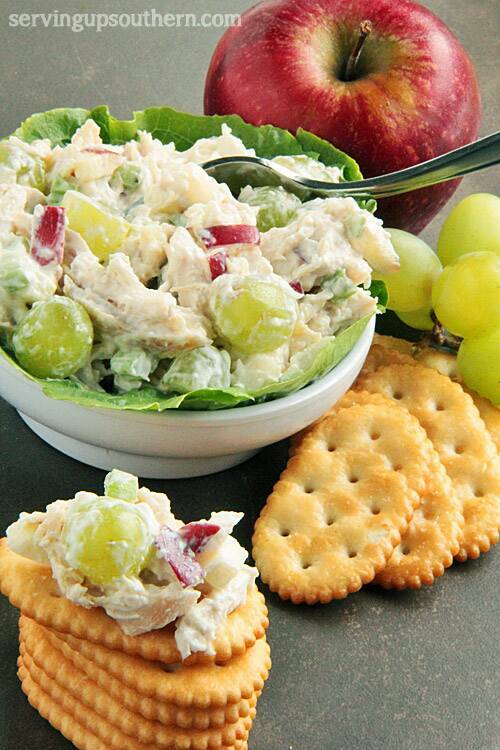 Today, I’m sharing my daughter Megan’s recipe – chicken salad with apples & grapes. This will give you a base to start from. From here, you can easily add or subtract ingredients while creating your own favorite combinations. For that reason it’s really hard to proclaim any chicken salad recipe as being “the best”. I’ve had it many different ways and loved many of them. But, I will tell ya that this one is right up there with the best. My favorite thing about this chicken salad with apples & grapes recipe is that it’s not drowning in mayo and sour cream. It has just enough to bind the ingredients. Also, I will often buy a couple of already roasted chickens to speed things up because our life can be hurried like that. I’m sure y’all don’t have a clue what I’m talking about, right? Right! You can serve this on crackers or bread, in pita pockets or wraps – whatever tickles your fancy. Or, if you really must you can eat it off a bed of lettuce. I’d love to know what favorite ingredients you put in your chicken salad? You can let me know in the comments. Combine all ingredients in a large bowl and mix well. Cover and refrigerate for at least one hour before serving. Amber, Hooray! I’m so glad you enjoyed it! I love your combination – very colorful! Thanks so much for sharing! About how many servings does this recipe make if serving on croissants at a luncheon?